At times when you need a boost of confidence in your smile, any improvement can make all the difference. Dr. Jae Byun provides professional whitening as part of his full complement of cosmetic dental solutions, giving his patients brighter, naturally appealing teeth. Dental Ambitions offers chairside, laser, and take-home teeth whitening on the Upper East Side, Midtown Manhattan, and the surrounding neighborhoods. Call and schedule a consultation to discover which transformative option is right for you. Zoom!® Chairside Whitening – This same-day option is preferred by the majority of our patients due to its efficacy and convenience. Treatment with Zoom! involves the use of a special, light-activated gel that leaves patients smiles improved by multiple shades after just a single visit. In-Office Laser Whitening – Using a dental laser and conventional whitening agents, Dr. Byun can target specific areas of discoloration to produce a brighter, more uniform appearance. Patients who come into our office for this treatment achieve immediate results. Take-Home Whitening Trays – Ideal for patients with sensitive teeth, whitening through the use of professional grade bleaching agents and custom trays allows for a gradual, measured process. We take digital impressions and work with labs using the latest technology to ensure the trays you receive have a comfortable, precise fit. Depending on your preferences and individual timeline, each of these services can be performed as a standalone option or together with the other whitening choices. At Dental Ambitions, we understand that improving the aesthetics of a smile consists of more than just whitening teeth. During your consultation visit, Dr. Byun works with you to understand your cosmetic goals so that he can create a dental appearance that meets your expectations. Often, this means pairing professional teeth whitening with other services and procedures as part of a comprehensive treatment plan. We perform whitening prior to placing porcelain veneers or crowns to ensure uniformity is maintained after these enhancements are added to your smile. For patients seeking straighter, brighter teeth, we can provide whitening gel to be used in conjunction with Invisalign® clear aligners. Searching for a More Brilliant Smile? Contact Dental Ambitions Today! Improving your personal appearance can be the first link in a chain reaction of positive changes, from having the courage to pursue your dream job to meeting the potential love of your life. Dr. Jae Byun is motivated by the role he plays in this process, providing treatment to improve dental health and beauty. 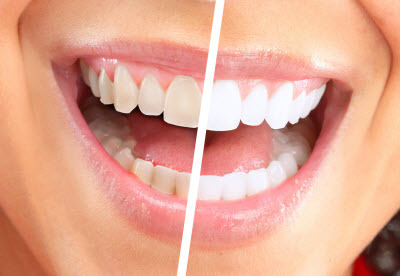 For more information about professional teeth whitening on New York City’s Upper East Side, reach out to our office today and schedule an appointment.